Feminine and irresistible: the fragrances by Pink Sugar are dedicated to women of any age who want to immerse themselves in a cloud of pure sweetness. Discover all the products and let yourself be tempted by this seductive, enchanted pink world! The original Pink Sugar perfume is unique and inimitable. The unmistakable pink and white packaging design encloses a sweet and carefree eau de toilette that awakens the most exquisitely feminine side of every woman. Dive into a candid cloud of cotton candy, lose yourself in a fruity sense of the gourmet with touches of vanilla and caramel, between childhood memories and seductive aromas with oriental notes. 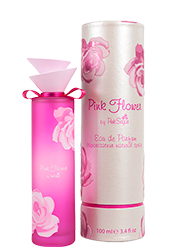 Let yourself be enveloped in the sweet and sophisticated notes of the Pink Flower by Pink Sugar fragrance. Within the elegant packaging, you will find a refined scent, suitable for the modern and energetic woman who embraces her femininity and loves to immerse herself in a fascinating, floral world.